I'd been really looking forward to my next Discworld installment, as Reaper Man is the next part of the Death series. And you're probably aware of how much I enjoyed the last time Death was centre-stage. The fact that my husband, the resident Discworld nerd, couldn't remember the plot was somewhat concerning though. Having decided that Death has developed too much of a personality to properly perform his duty, a group of strange cosmic auditors announce that he is to be retired. With no work to do, and limited time on his hands, Death decides to venture out into the world and experience living before his successor arrives to take over. In the meantime, however, people are still dying, but with no Death to collect their souls, things start to take a bit of a strange turn elsewhere on the Disc. I'm not sure how to feel about Reaper Man. On the one hand, it's Death, my second favourite character after Vetinari. On the other hand, it doesn't really feel much like a Death novel. For one thing, half the novel focuses on the efforts of Windle Poons and the other faculty members from the Unseen University. While I am quite fond of some of the faculty, *cough*Bursar*cough*, I thought that the wizard section was just generally weaker than the Death section, especially once it got to the weird sentient shopping centre thing at the end. But even then, the Death section is a surprisingly slow look at the rise of industrialisation in the farming industry. I just about works considering Death's proclivity for scythes, but when put together with the aforementioned sentient shopping centre, I get the feeling that the satire may have been a bit harder to work this time around. 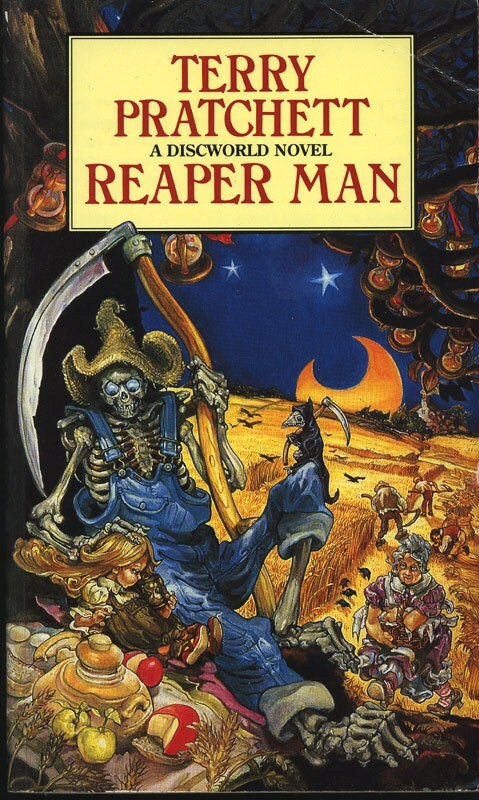 Don't get me wrong, I still thoroughly enjoyed myself, but Reaper Man was kind of disappointing considering how well-written and conceived Mort was.